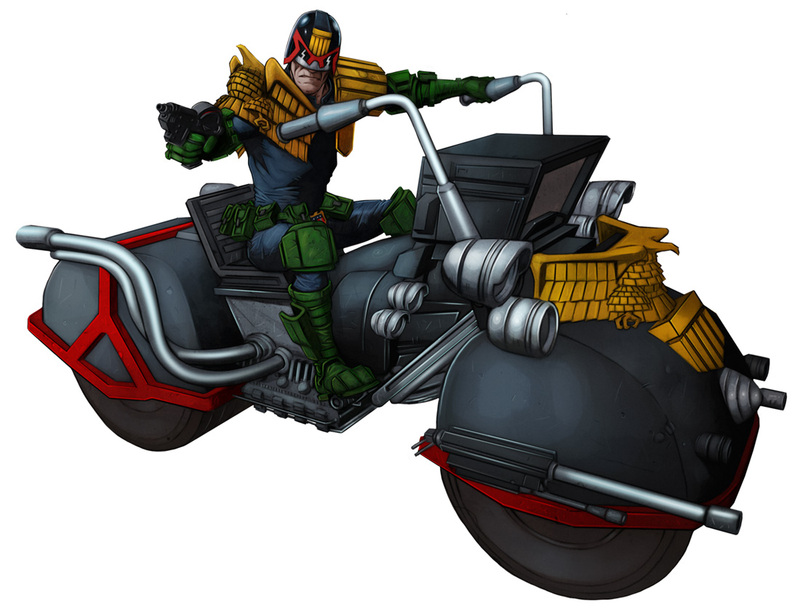 He IS the Law: and you’d better believe it! 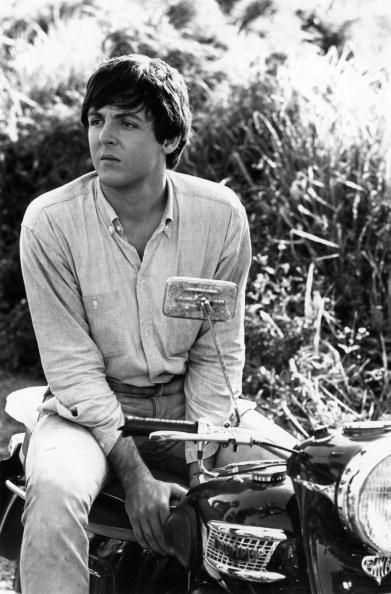 This could be prior to his infamous moped accident in late ’66. Where he cut his lip and chipped a tooth. Anyway he’s atop a Thunderbird, glossy black with spiffy nacelle headlight. I don’t know why she’s ridin’ so high. She oughtta do right by me. 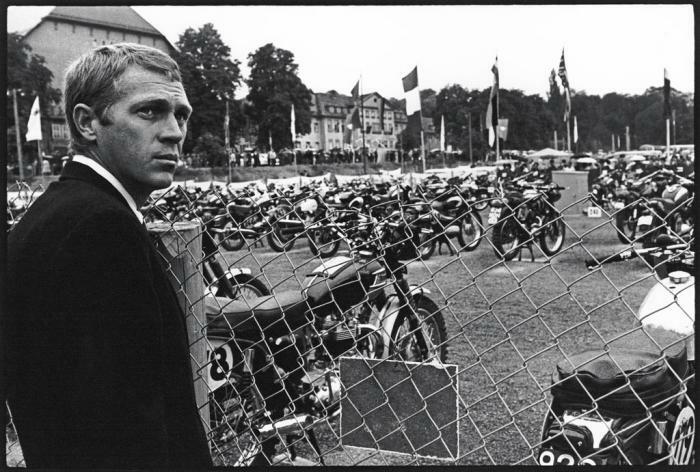 A McQueen fix, here’s wor Steve looking on at the ISDT rides quarantined from the riders pre-race. 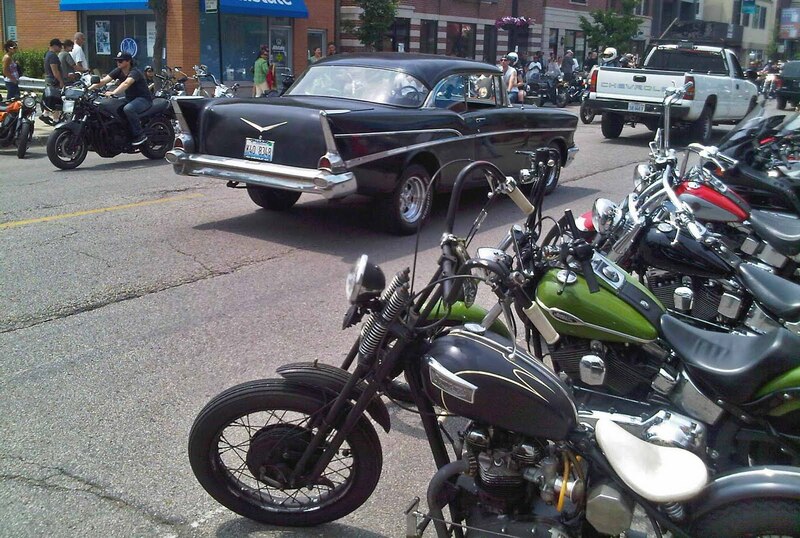 His is the one in front no doubt “278”. Pensive before the six days ahead! 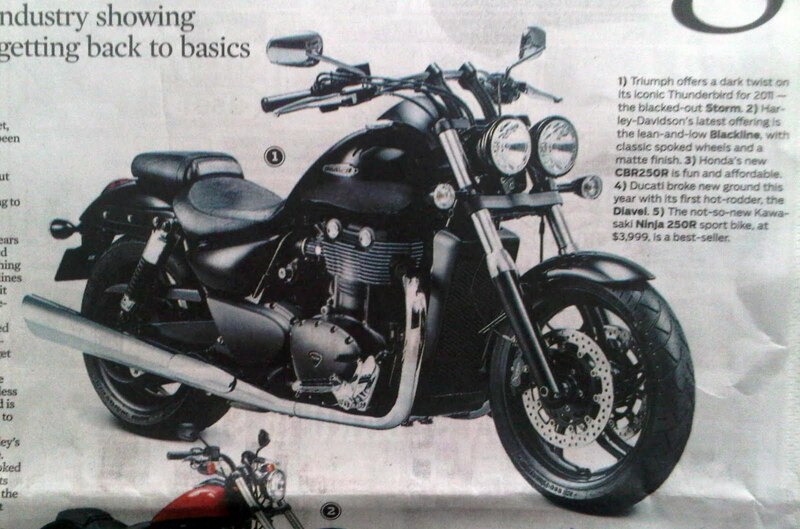 A new model in the Triumph line-up: the 1600cc parallel twin cruiser in a blackened finish called the Thunderbird Storm. 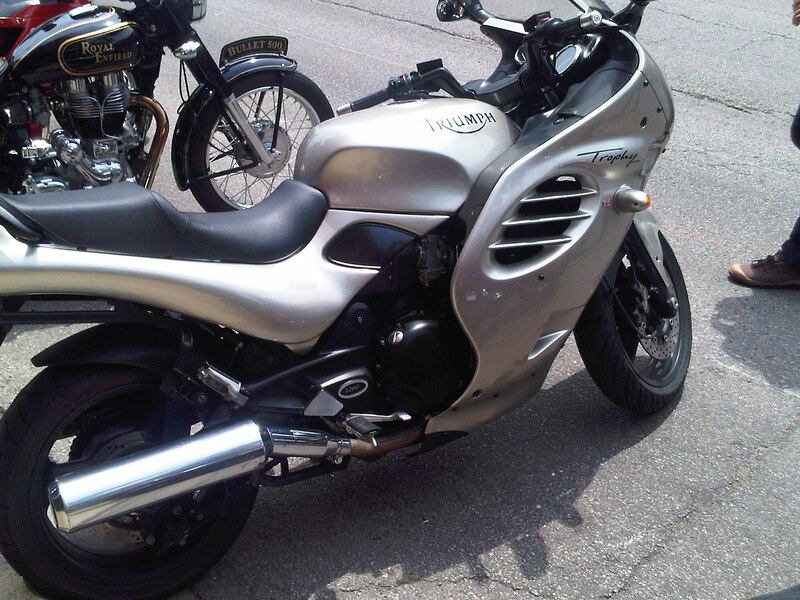 Twin headlights, wide seat and chunky rubber underfoot. 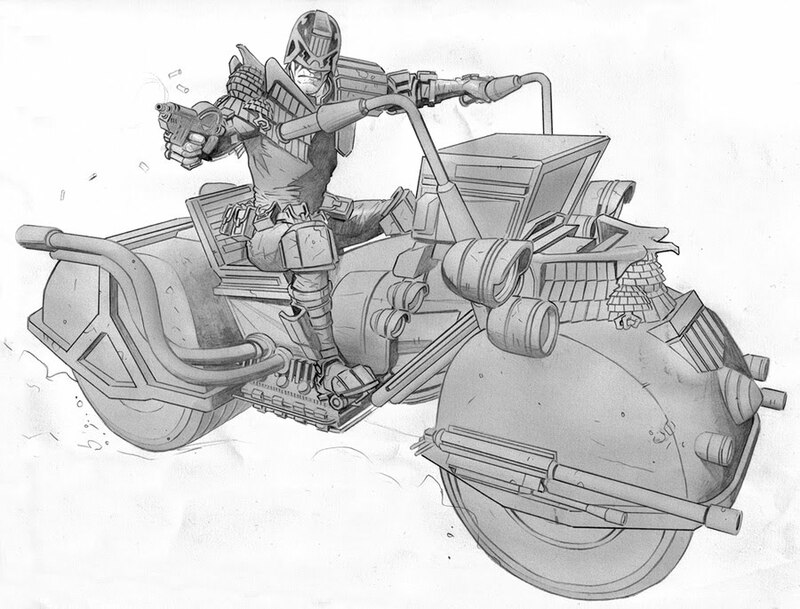 It looks like a GOOD ride, comfy width seat and bars, with, I’m sure, power to boot! Well, if ever I did go down the cruiser route, this is the one for me! 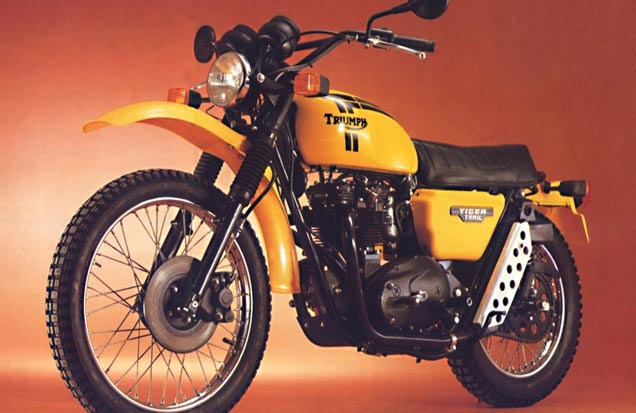 In the last breath of life in the Meridan existance of the Triumph name, one model was promoted in a small way for a very specialist use: the street scrambler. 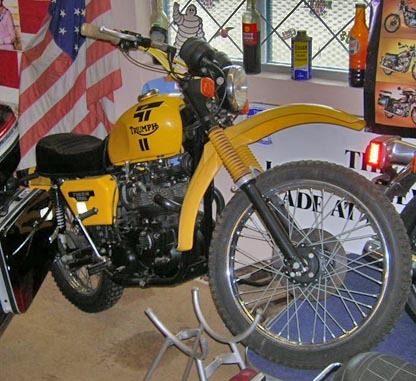 Using a name made from desert racing no doubt, the Tiger 750 model, TR7R, was, in 1982, given a fresh lick of paint, big front hoop with knobbly tire, long front forks, engine bash guard and natty headlight mesh. 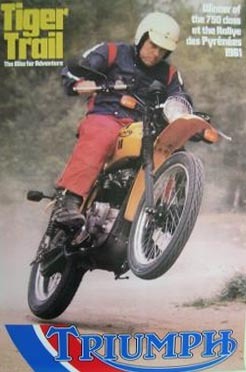 A little too heavy against the lightweight two-strokes offered by Suzuki, Yamaha, Kawaaki and Honda; or even the 600 4 stroke singles for that matter. The only direct competions would be the newly released BMW GS80, embryonic monster trail, grandpappy of the big GS1150 used by globetrekkers now. 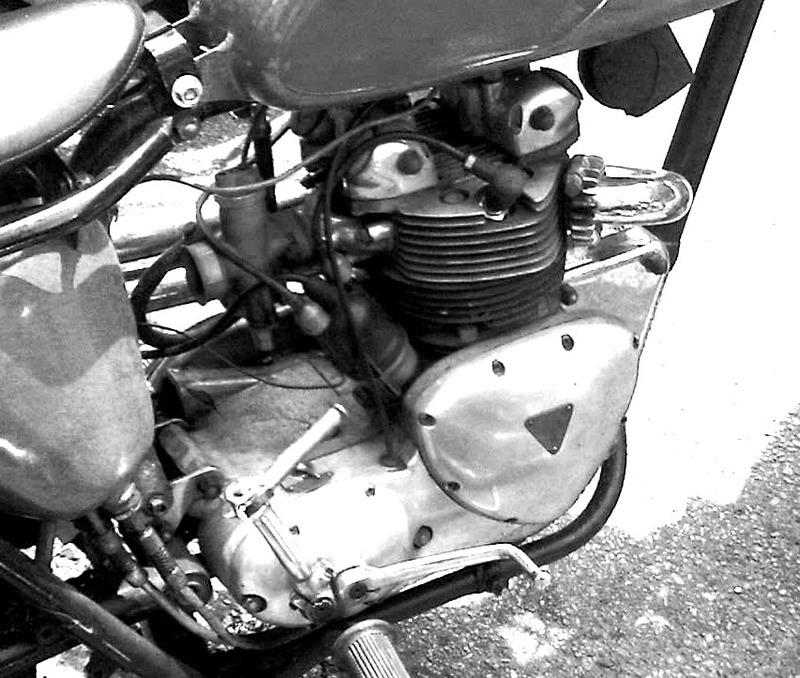 The blackened engine is aimed at the Yamaha crowd of the time. As is the boxy silencer. 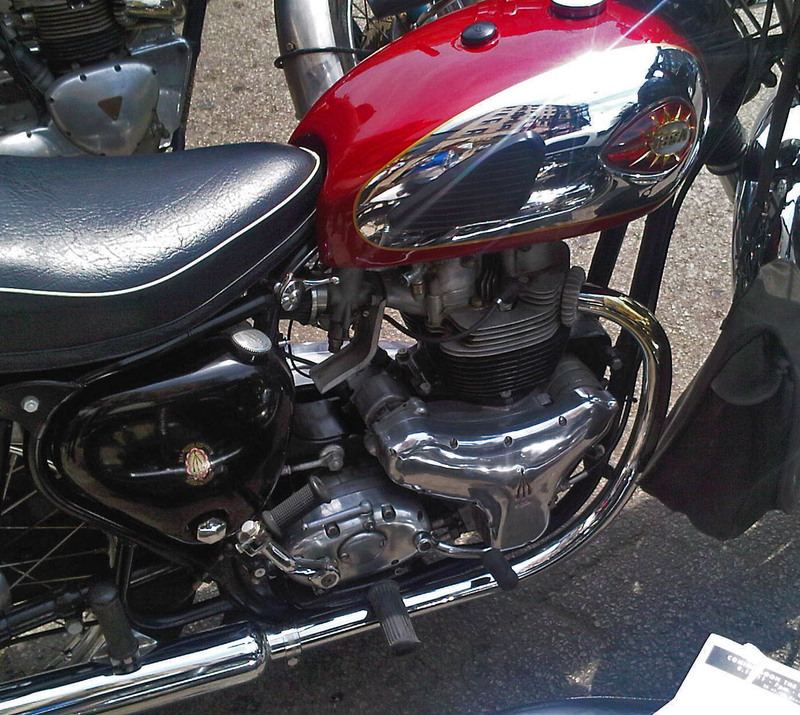 Here’s a clean example on display at the Motorcycle Museum in London, wheel displayed aloft in expected ride style! Big plastic off-road mud guard in front, very un-triumph! 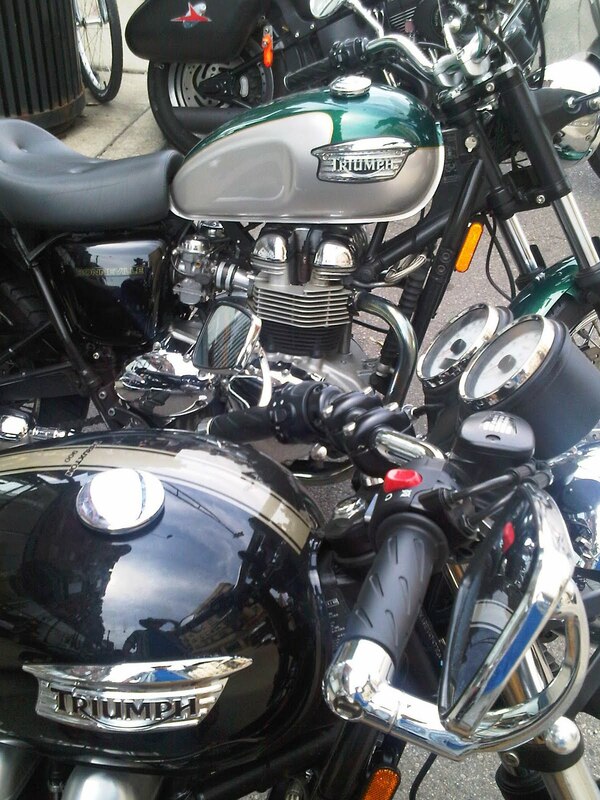 A clean example at the Ace cafe; a brace of enthusiastic onlookers enjoy it’s company! Left hand gears, disc brake front, drum rear, short seat, wide braced bars, kick starter. 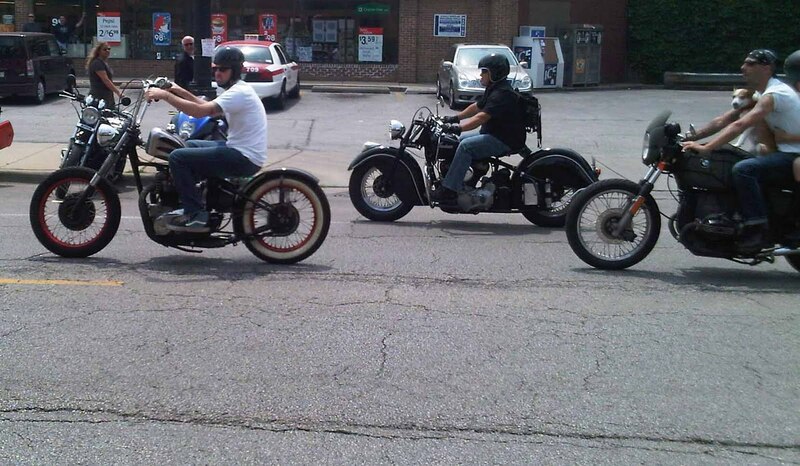 This looks like it would actually be a fun ride for adventure travel! Just need some period looking aluminium panniers! 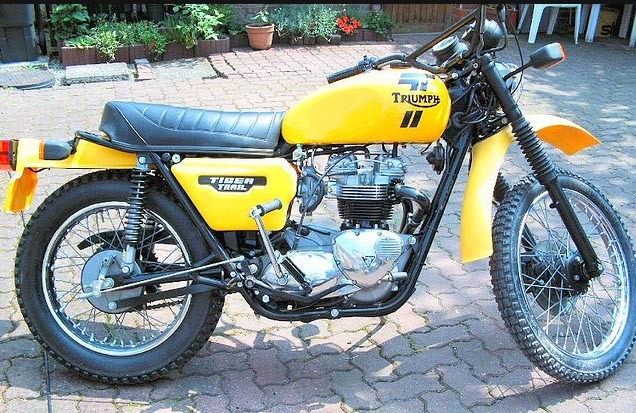 Shades of todays Scrambler 900 model? Here’s a couple more views of this little corker of a ride! Enjoy! Oh, and it seems to be as rare as hens teeth! 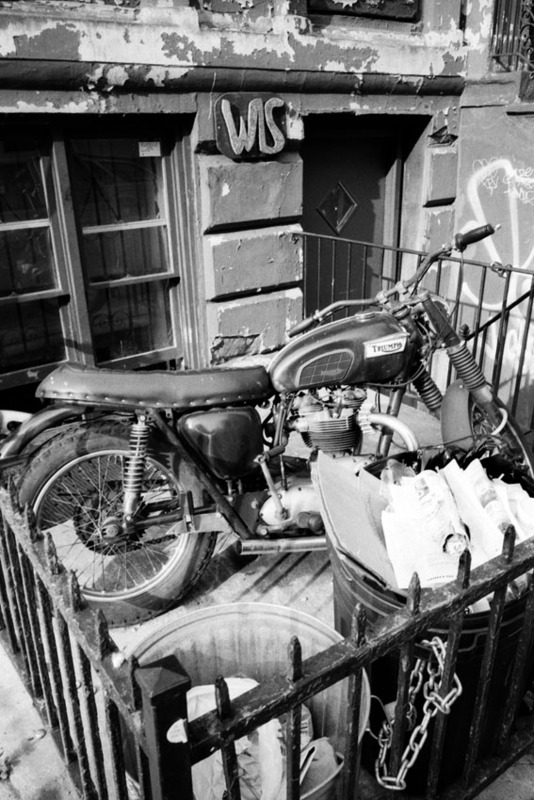 A few cafes from other makes also made appearances at Delilahs: starting off with a sweet Kawasaki W650, the twin based on a 60’s motor; more so than the newer Bonnies. 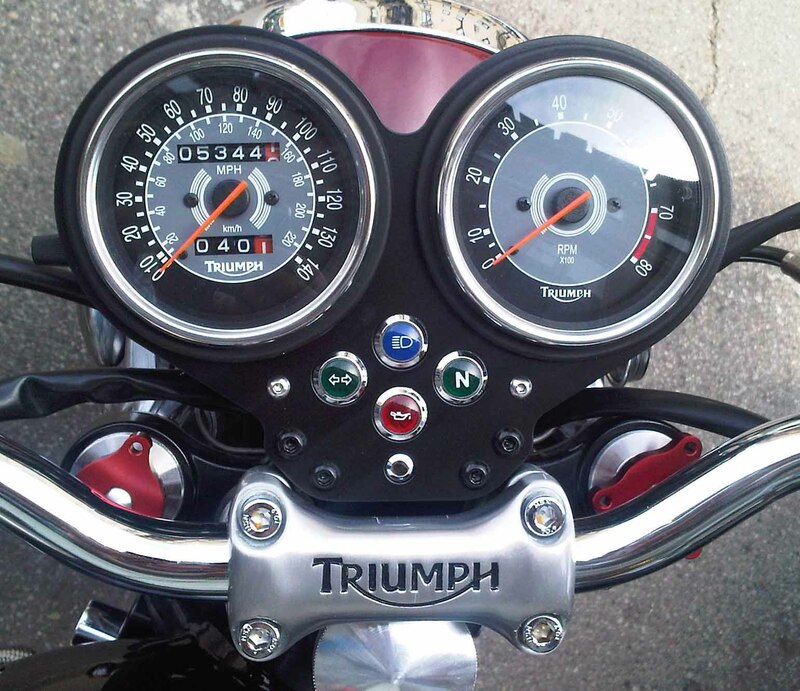 Clubmans, alloy petrol tank, ally rims, rear-sets, bum stop seat: what more could you want? 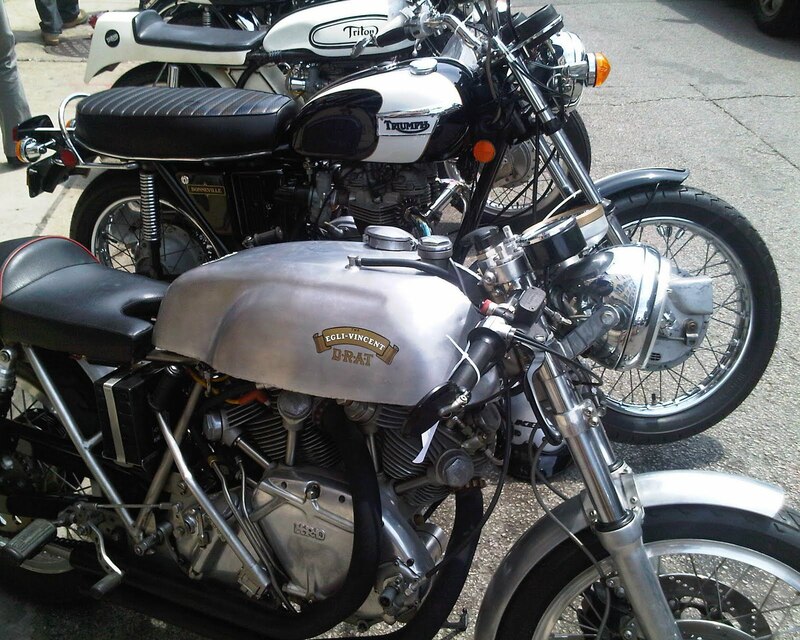 Triton, Triumph, Egli-Vincent! A Hat trick! 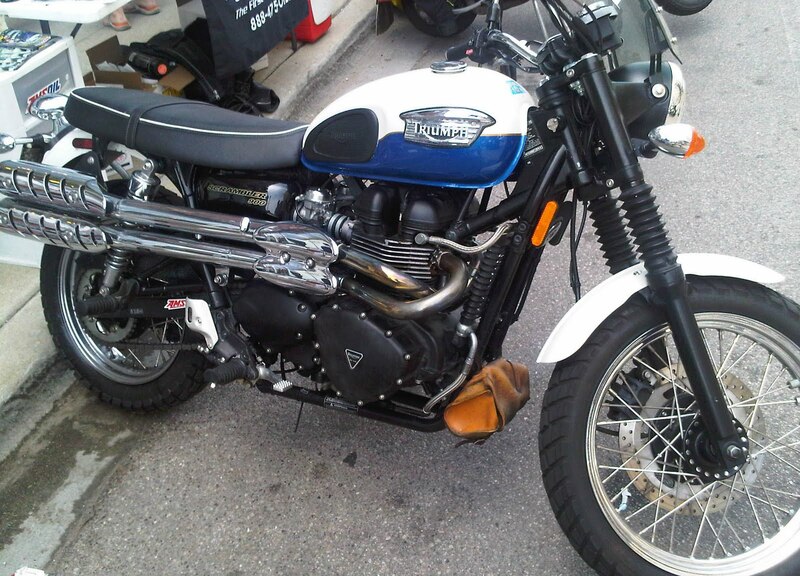 The Triton, resplendent with well patch’d leathers and chequered puddin’ bowl. 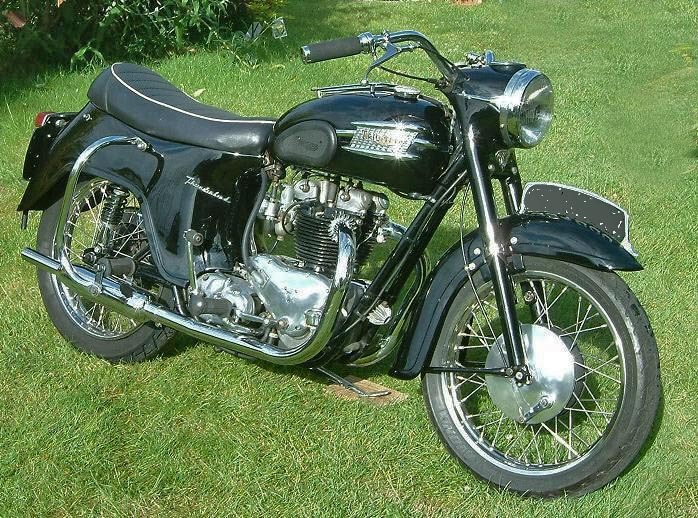 The Pre-Unit BSA A10, a smashing example of this fine, fine motorcycle. Very close to my very own RGS. 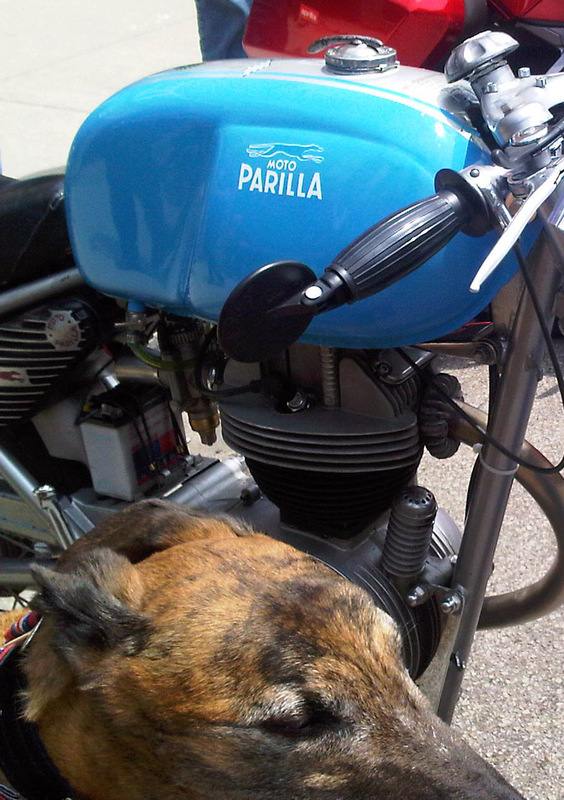 Geordies ‘cycle… the blue Parilla racer. Streamlined noses abound! 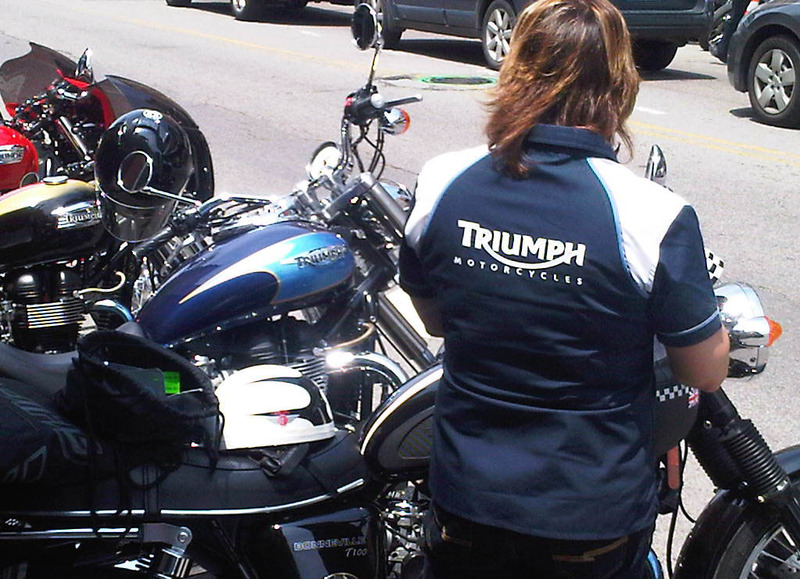 Why Triumph? Is it the name? 2. To rejoice over a success or victory; exult. 3. To receive honors upon return from a victory in ancient Rome. Used of a general. 1. The fact of being victorious; victory or conquest. 2. A noteworthy or spectacular success. 3. Exultation or rejoicing over victory or success. 4. A public celebration in ancient Rome to welcome a returning victorious commander and his army. 5. 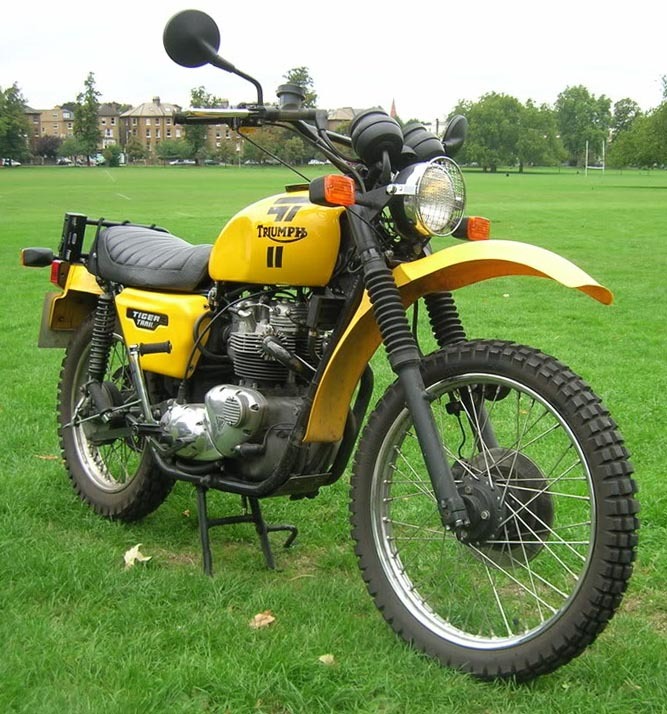 The pre-eminent motorcycle from the Midlands area of the United Kingdom. 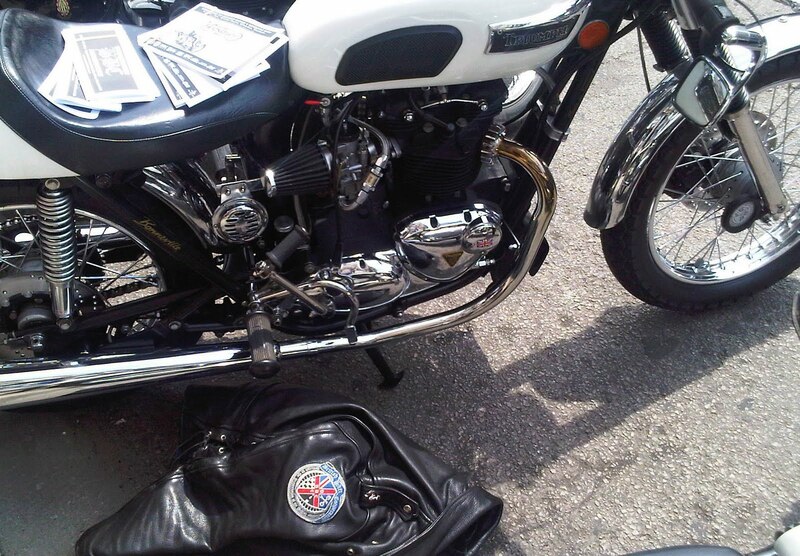 Here’s an ample selection of details from the bike at the show; all Triumph of course! 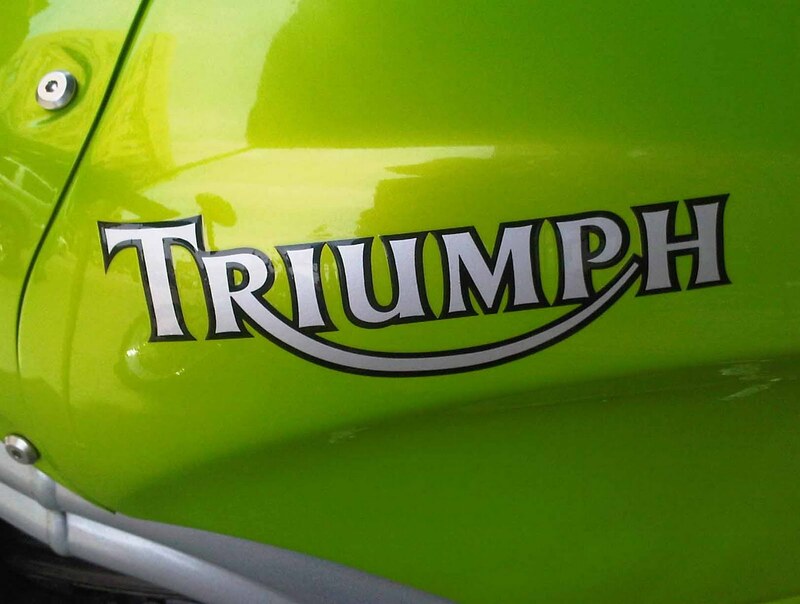 Starting with the tank badge of my favorite, the green Speed Triple. The mean bug-eyed monster. Clocks from a newer Bonnie, nice clamp name detail. 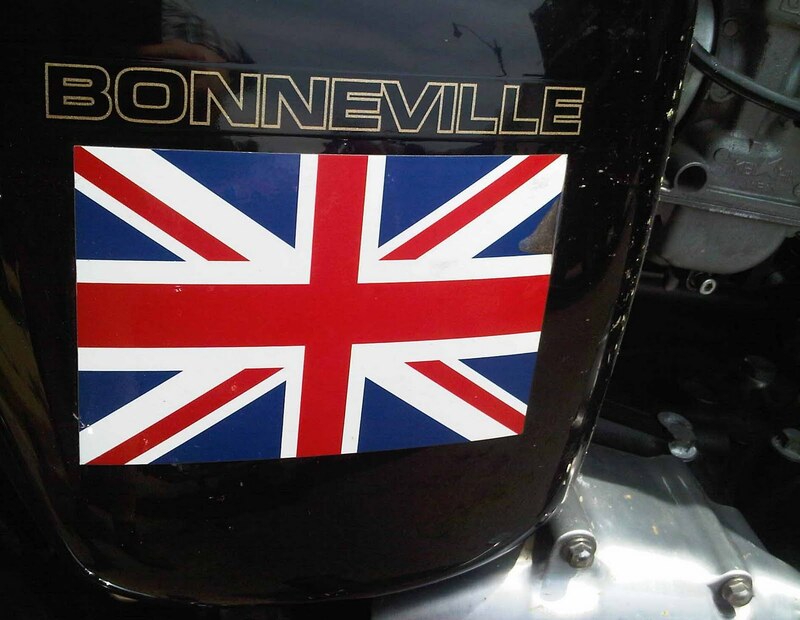 Bonneville ‘Oil Tank’ name and flag. 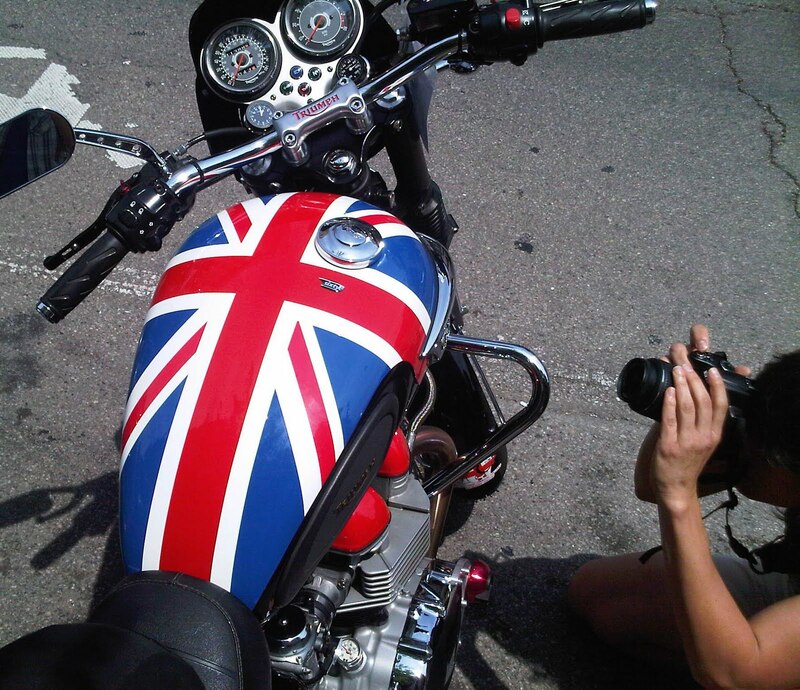 Patriotic or what! 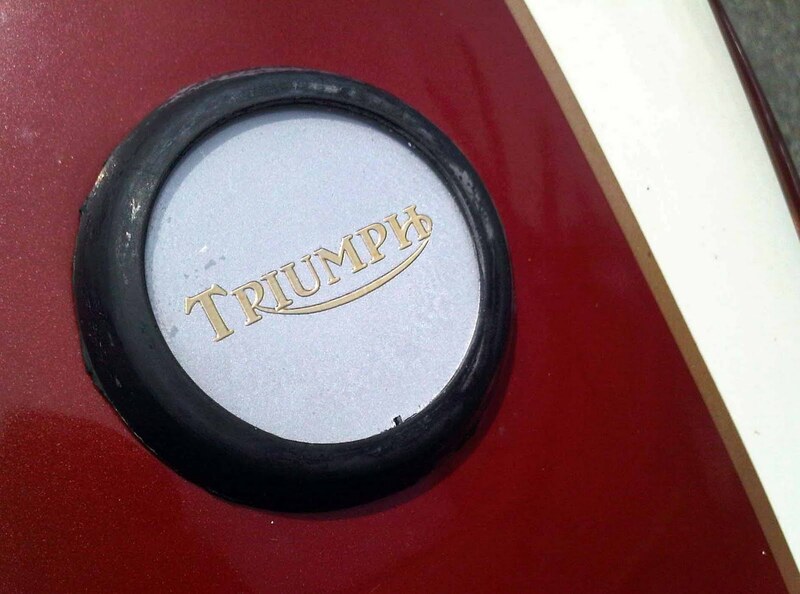 Center tank bolt cover badge. I need one for my tank. 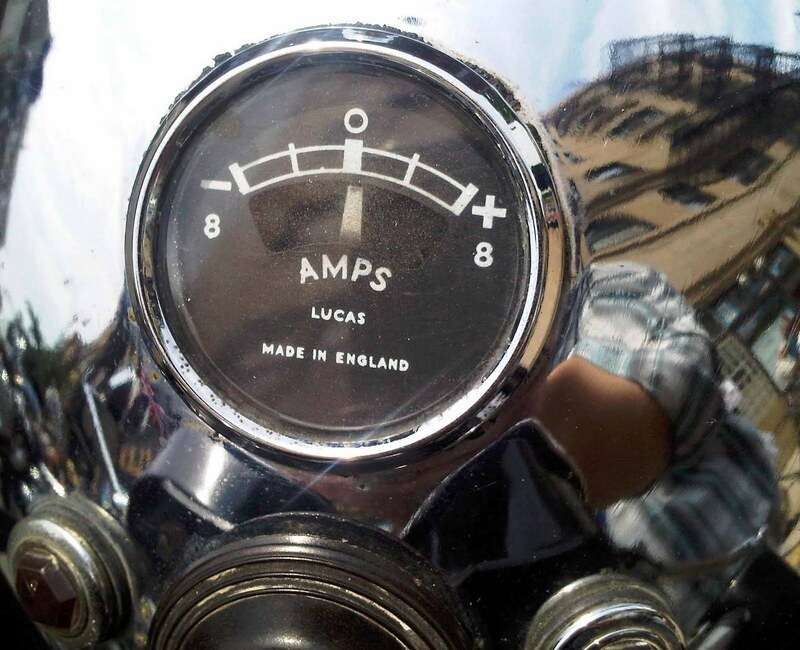 The Lucas Ammeter, the ‘Lord of Darkness’ reigns supreme! Or so this indicates! A Tiger and its stripes. 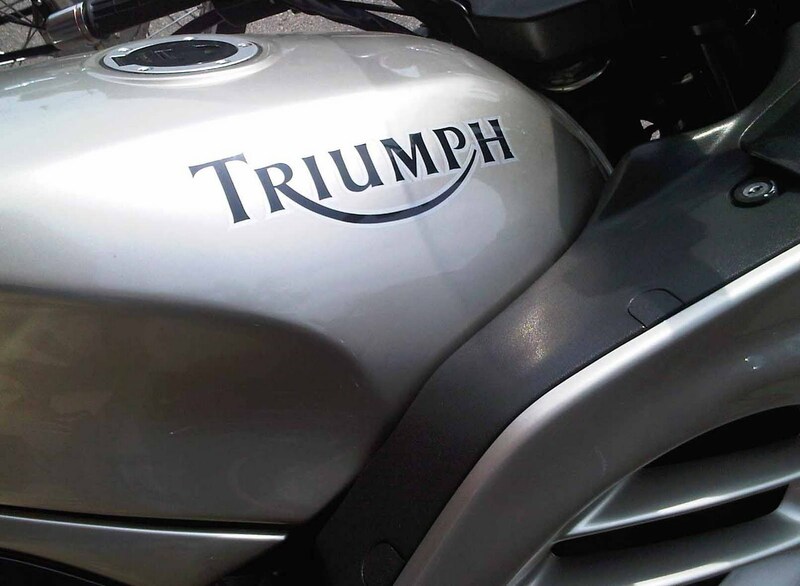 The clean monochrome look on the Trophy touring bike. Sublime. 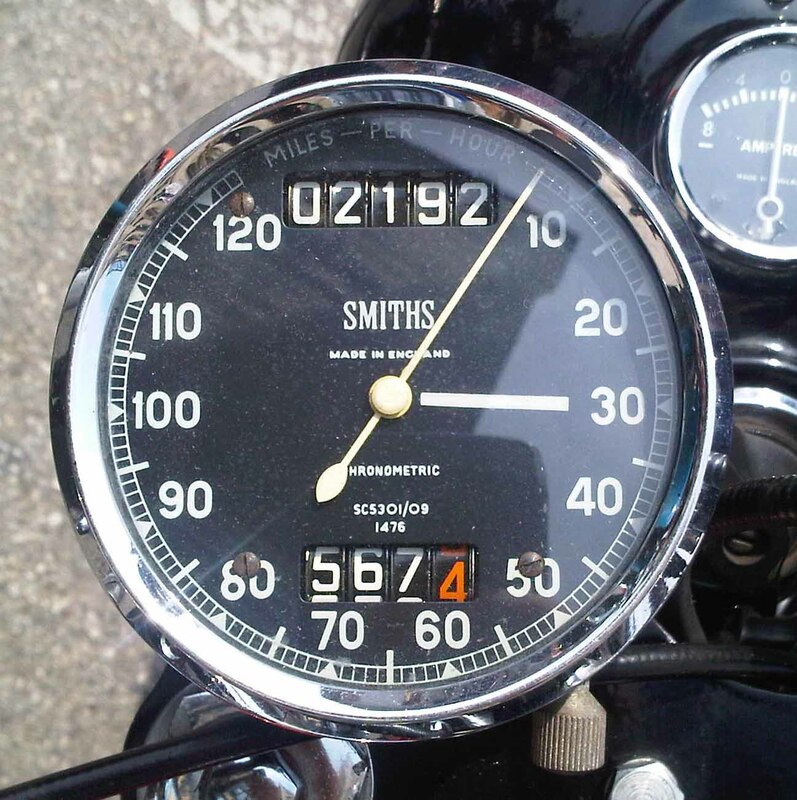 …and finally the Smiths Chronometric speedo; 120 m.p.h. sir? On a Bonnie in favorable conditions? Nearly! Neverthless a beautiful graphic, used in British ‘cycles and sports cars of the period. 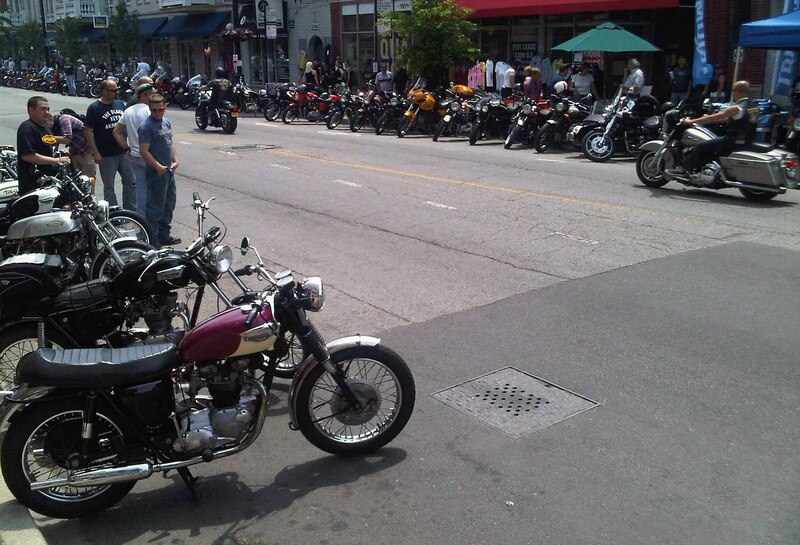 Here are the older Meriden Triumphs at the street show, each with their owners mark on them, each with mileage and aged patina giving an certain ‘life’ to them. 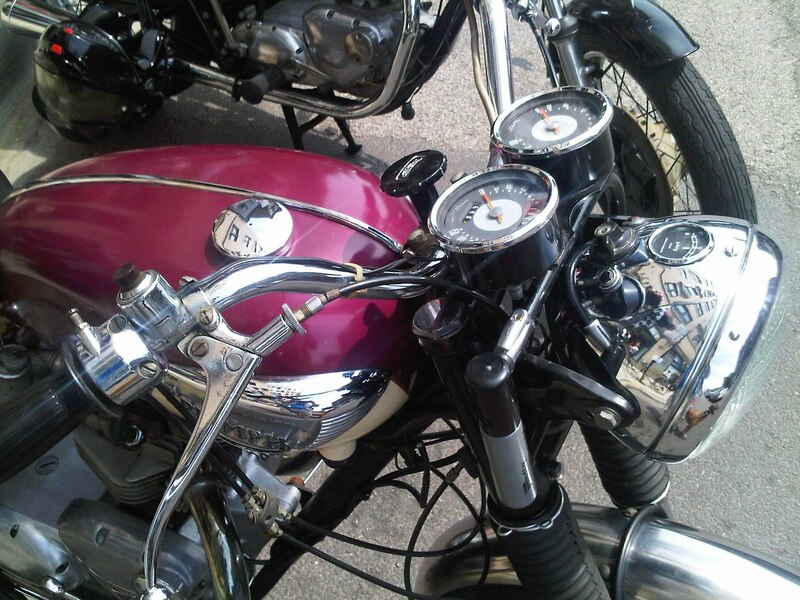 Plum late 60’s Bonnie: Simply Gorgeous. 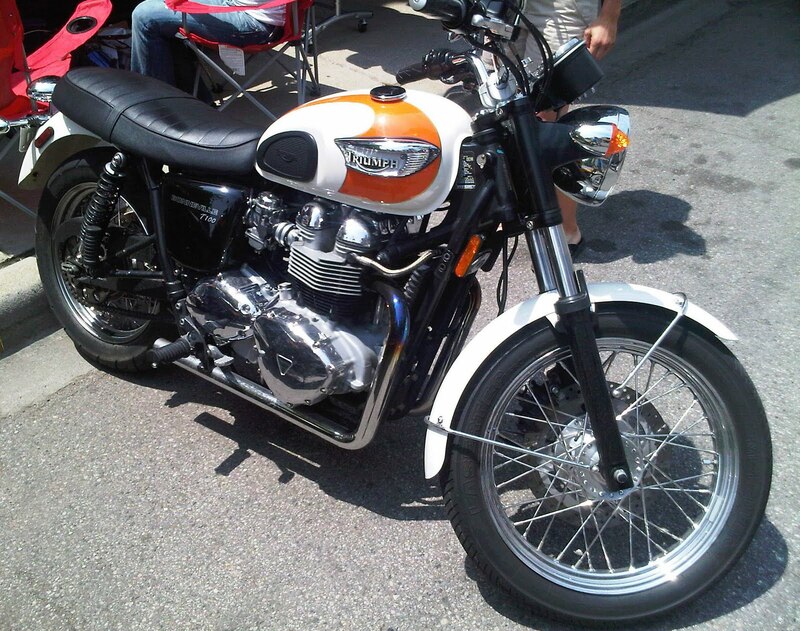 Mid 70’s oil in frame left shift 750 Bonnie. Carefully prepared and maintained. 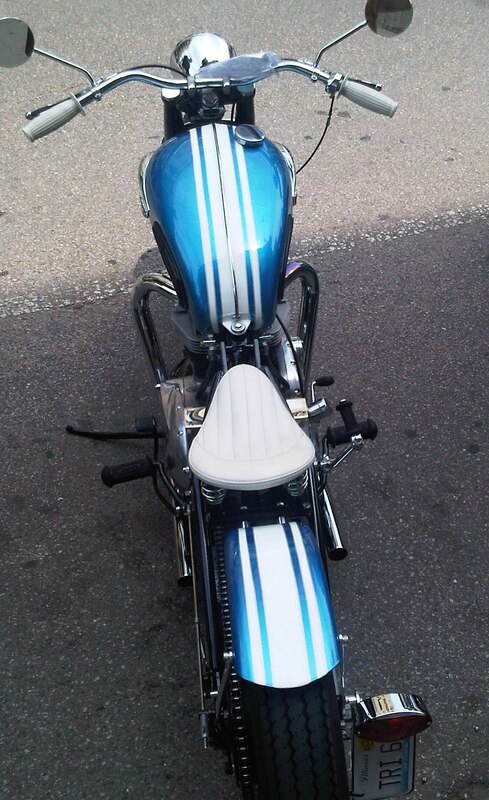 A bobbed 650, pinstriped thruugh like Blackpool Rock! 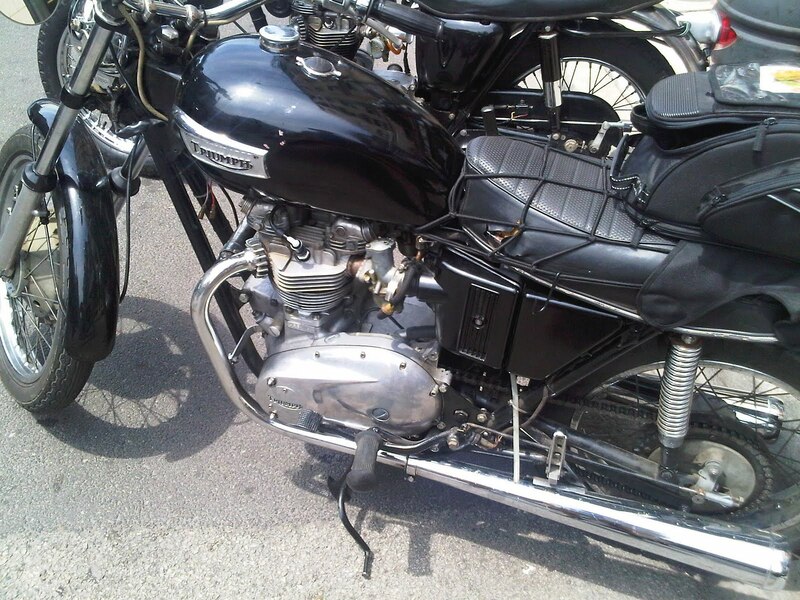 My Bonnies dark brother, A clean 71/72 OIF Bonnie. Mid 60’s Unit lump; A fine engine. Super clean early 70’s OIF, nice white ‘horns’ on the ebony tank. 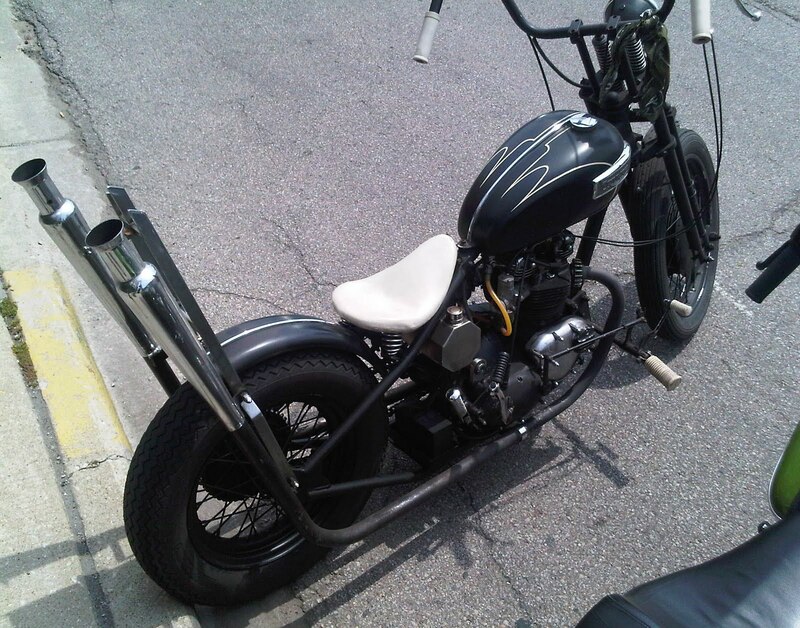 Pre-Unit hardtail chopper. 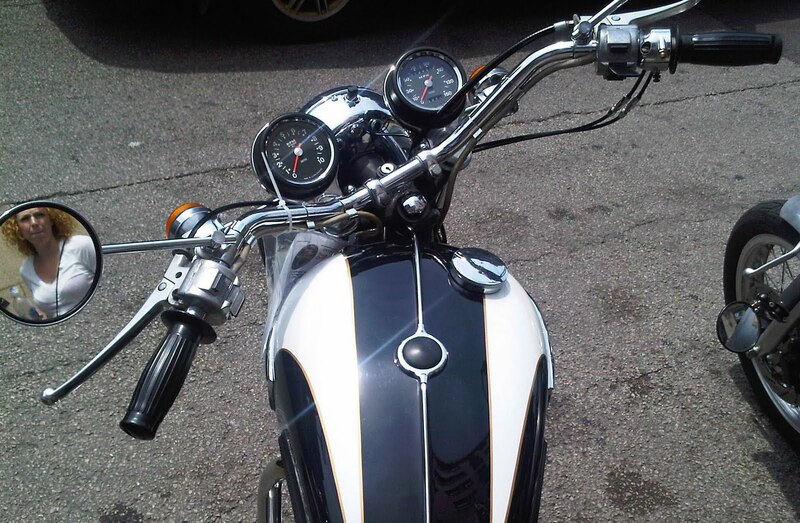 Funky ape hangers, high, high pipes and batwing pinstriping. 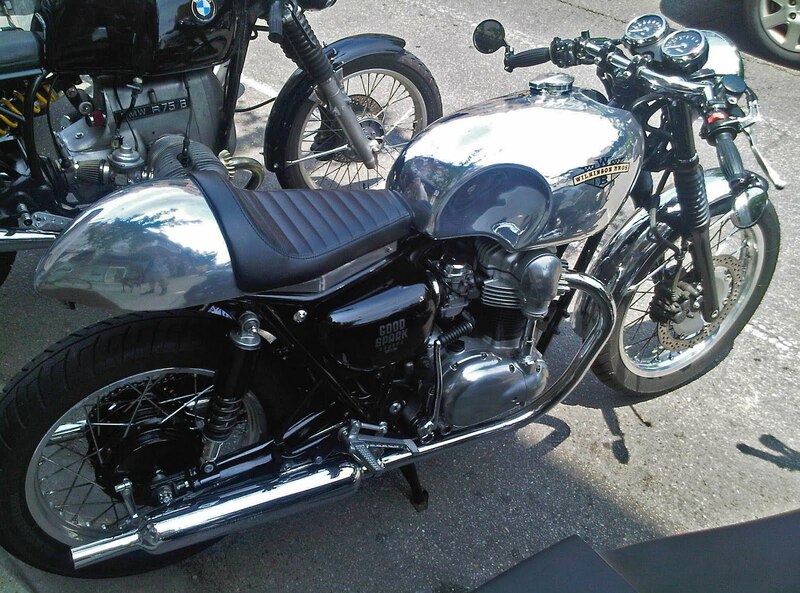 Mirror finish cafe’d Trumpet. Rocker ready! 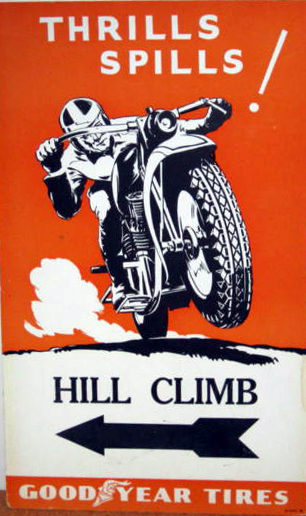 Some neat ‘Flyers’ were prepared to promote the show; Mods vs Rockers as the inspiration. 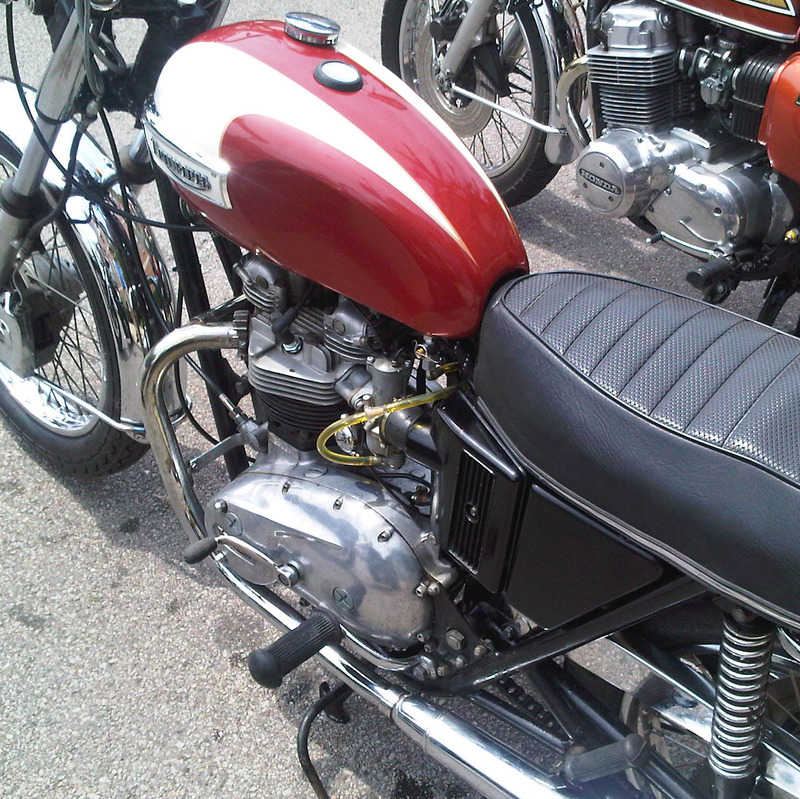 A BSA Goldie for the backdrop in neon pink and orange is inspired. Nice clean poster. A close-up of the MvsR graphic, puddin’ bowl and cap. 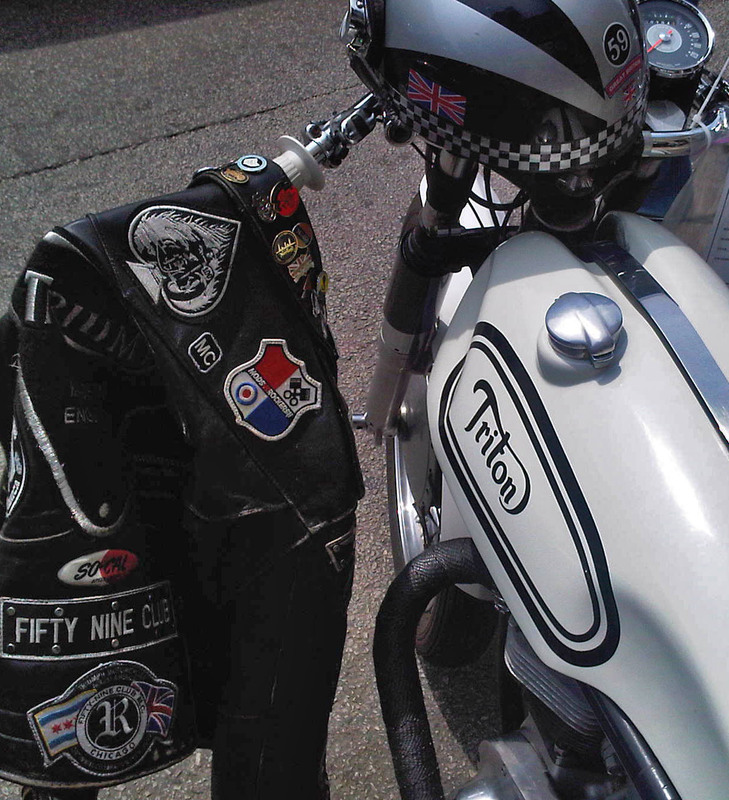 RAF roundel mod emblem & spade ’59’ badge. 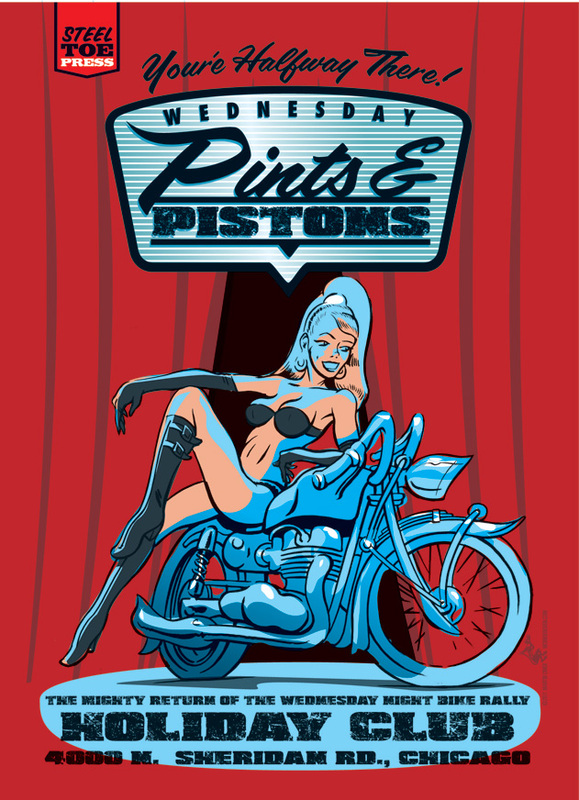 A super ‘screen-print’ image for the weekly meeting at a local hang out for bikers. 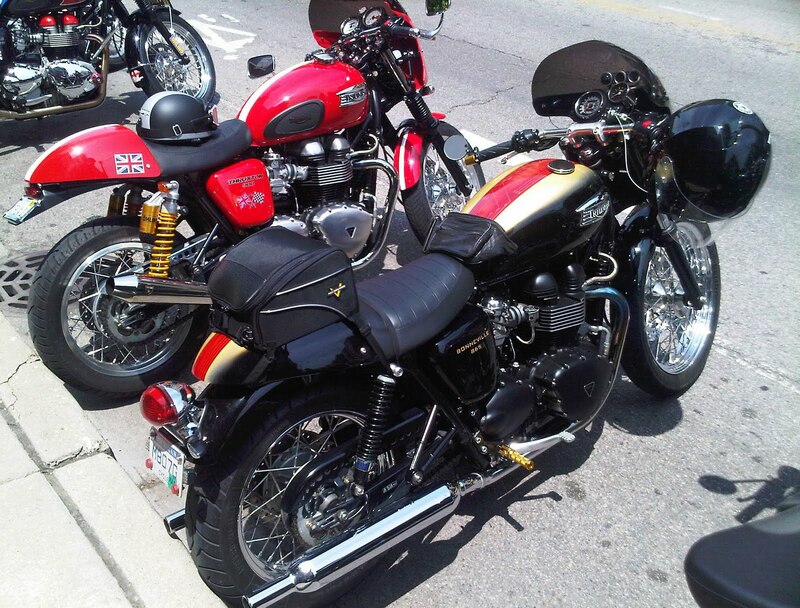 I concentrated on the Triumphs: starting with a good range of the newer Hinckley models, each with their own personalized modification to varying degrees. 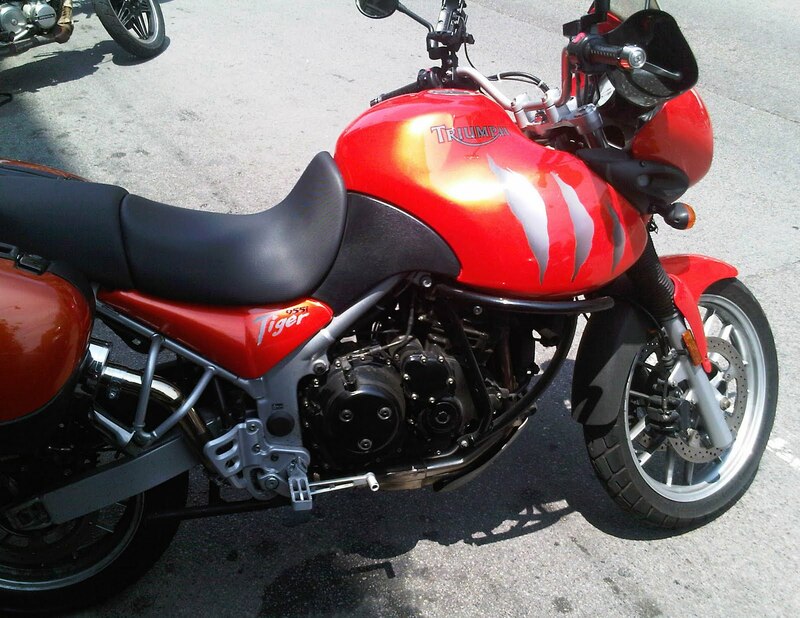 The modern Tiger, tall legged ready for roadgoing adventure. 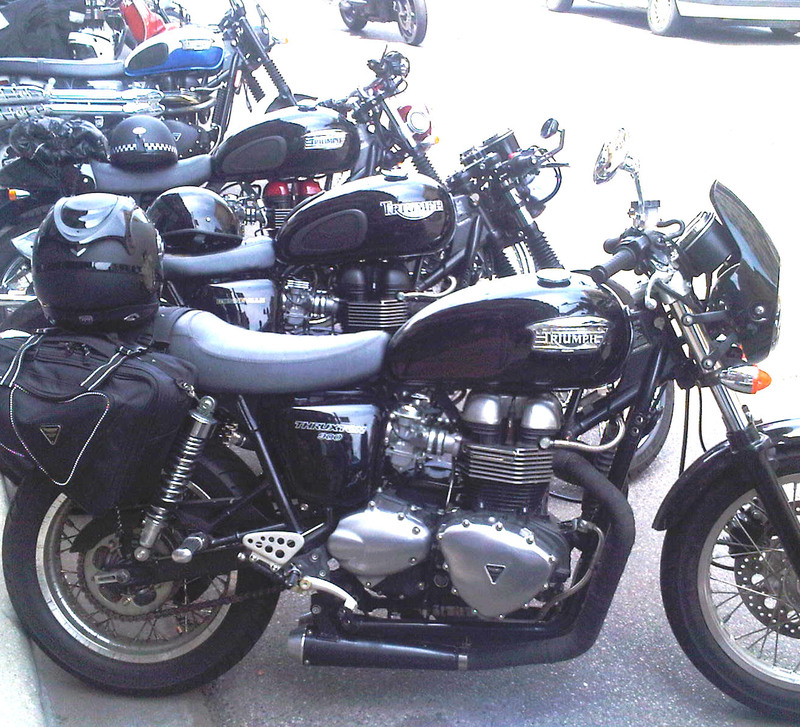 A pair of Thruxtons with small fairings for a lively race look. The McQueen inspired Scrambler; a suitably fun based ride. 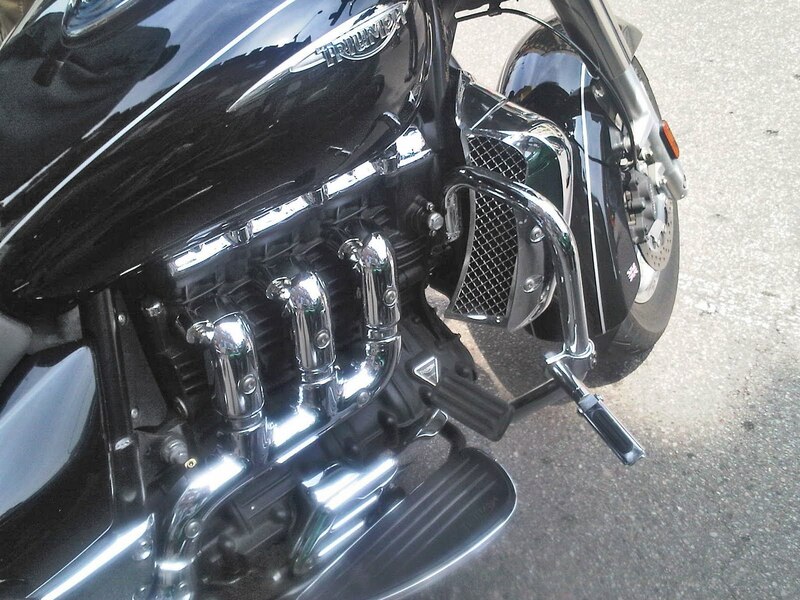 The sublime powerplant of the 2300cc Triumph. The rounded lines of the late nineties Trophy, competent speed and distance tug. 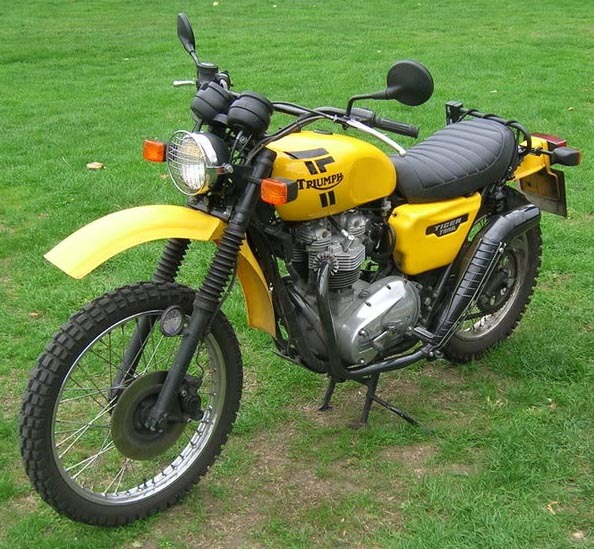 …and finally, a bobbed Triumph. 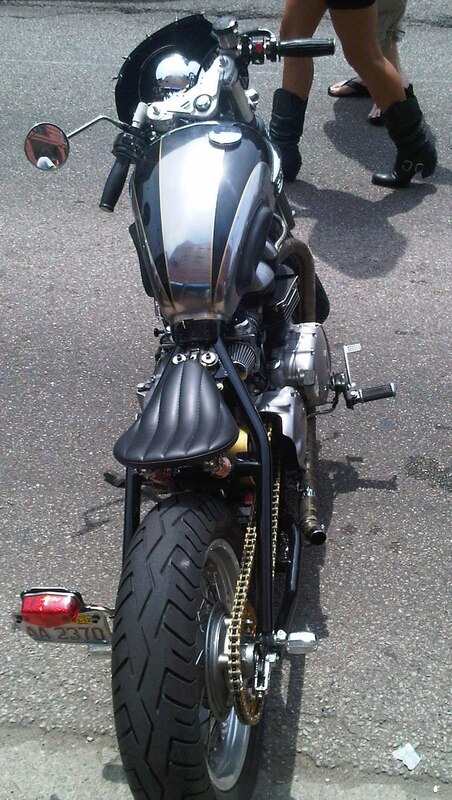 Hardtail and sprung saddle; though clip-ons and forward placed footrests may make an awkward seating position. But obviously a well-loved ride. 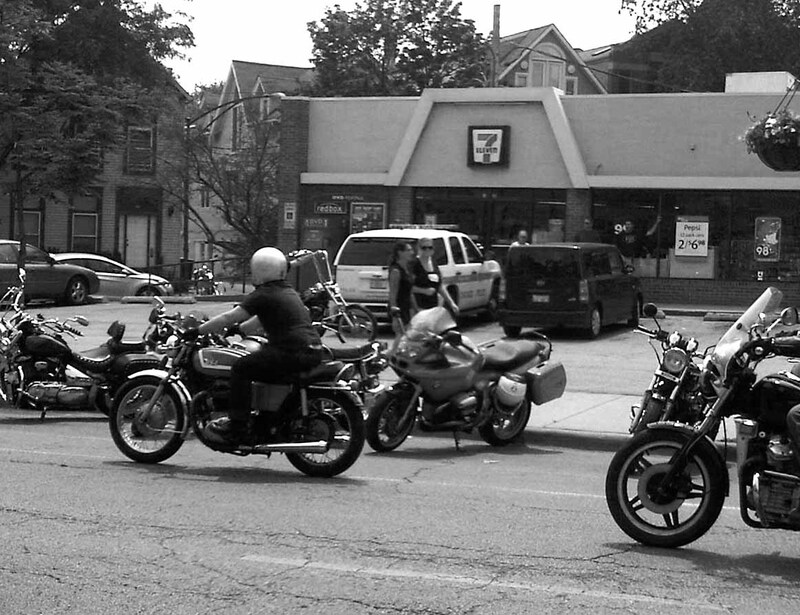 Today on Lincoln Avenue in Chicago, there was a street-wide bike show for all comers. 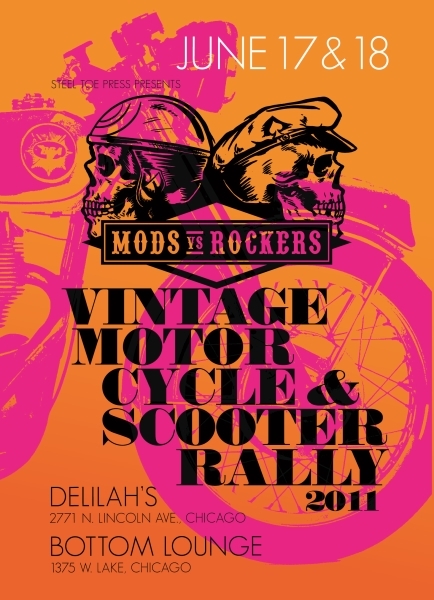 Based at Delilahs Bar, usual hangout for the Chi-Town ‘Mods vs Rockers crew, it drew crowds riding in on, and admiring, numerous makes of bike. 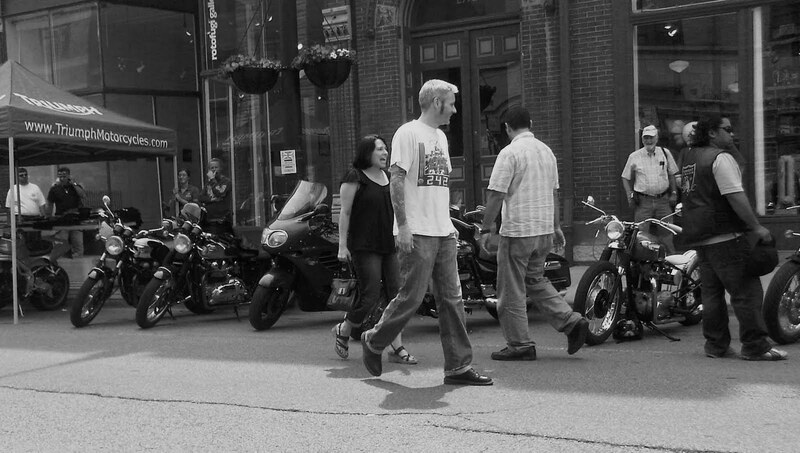 From dozens of Triumphs, Cafe Racers, scooters to the more esoteric Italian, practical German, and a few Harleys for good measure. 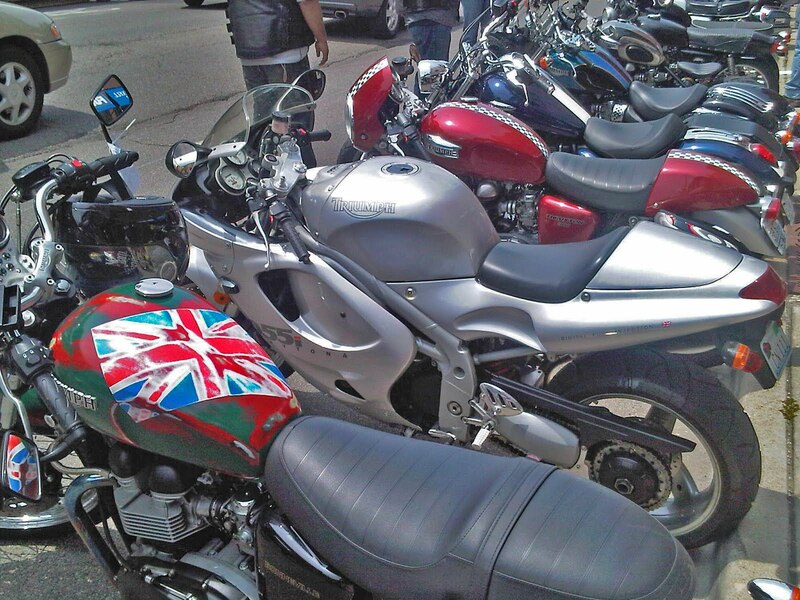 A great range of motos! 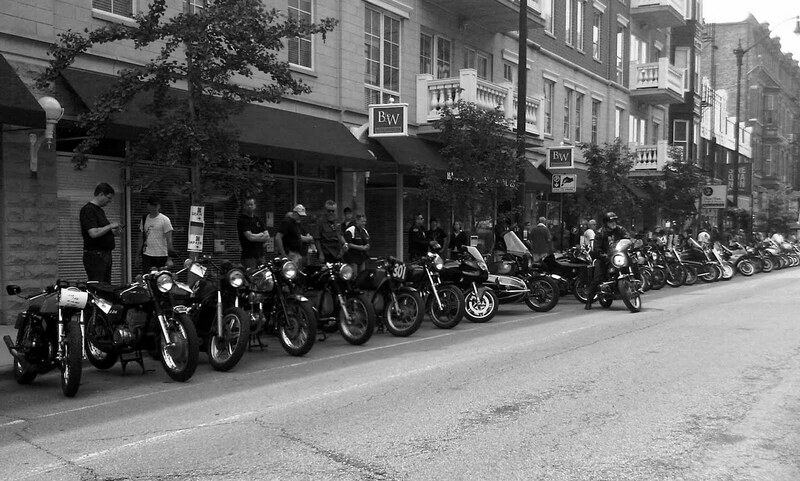 Had a super time looking along the rows parked on both sides of the street at this wide range of very personal rides. I’ll take a few days of this blog to cover what I saw! Enjoy! 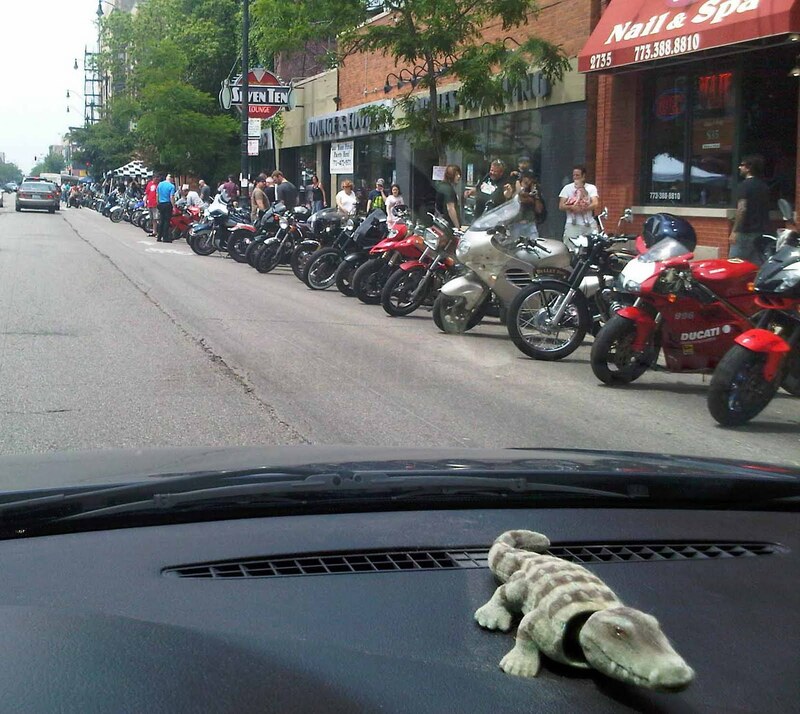 Louie the plastic dashboard alligator nodded in appreciation! Noddin’ on the dashboard next to me! Looks like a good time to be had by all: competitors and spectators alike! Love the orange & blue scheme. If all you’ve got is a small fenced yard then you’d better chain ‘er down. Hope this ride is loved otherwise and sees plenty of miles under her wheels! Back in the early 70’s physicist Carl Sagan helped promote and realisation of adding a message plaque to NASA’s Pioneer spacecraft. He devised a graphic representing an understanding of molecular physics as well as our position in space, down to which planet in the Solar System we are on. Also on it are images of a man and woman. 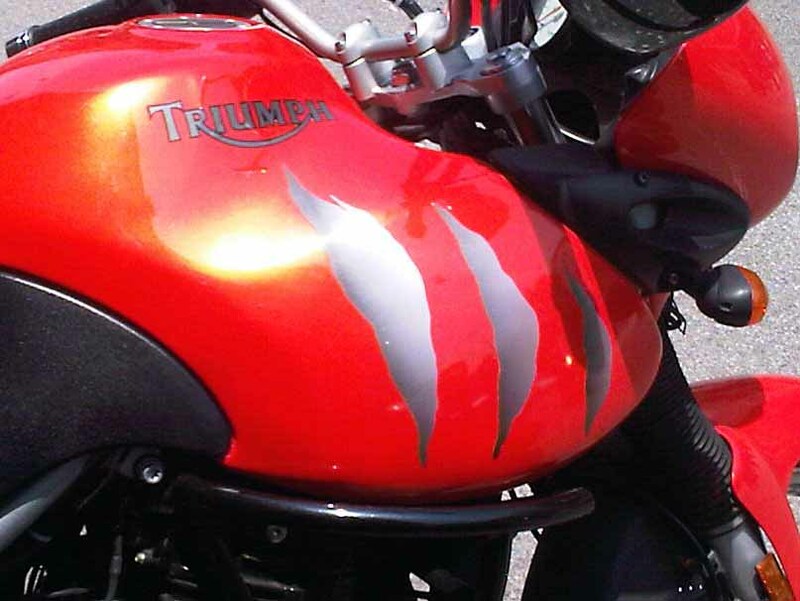 I’ve added the outline of a Triumph to let the extraterrestrials know that we ride motorcycles too!